Greece’s combustible politics have entered a hiatus. But 2012 is a decisive year and the country cannot afford an inertial start to the year. Political maneuvers since the appointment of a new prime minister in November 2011 merely cloak the fact that the country has reached a dead-end. It requires a new agenda for 2012. The first priority should be to grow the economy, not just to aid the fiscal math but to help hold together a fragile society. How to create growth? We first need to understand that Greece has had two recessions: from mid 2008 to early 2010, the recession was due to less investment, which is now half its 2007 peak. The recession in 2010 and 2011, by contrast, was due to lower consumption, which was caused, at least initially, by a tax-driven fall in disposable income. Given this diagnosis, investment is not going to provide reprieve, leaving external and internal demand as sources of growth. Net exports are a plus, but much of the change comes from lower imports and from a rise in petroleum products exports (which are first imported as crude oil). The onus is thus on internal demand, which means the state needs to offer tax relief and put money in people’s pockets. Can Greece afford to do this? At first glance, it is ludicrous to suggest tax relief to a country trying to shrink its deficit from 9% of GDP in 2011 to 5.4% in 2012. But it is not. The Greek government faces a choice: it can cut spending by antagonizing a small but powerful minority which works in the public sector, or it can raise money by taking a small chuck from everyone. The easy option is to push some pain on the many versus a lot of pain on the few. This logic is politically appealing but economically self-defeating. Greece is carrying on this path: the 2012 budget shows a revenue-driven drop in the deficit. Two data points show how ambitious the budget is. First, direct taxes as a share of GDP are expected to reach 11.4% of GDP, when this number has ranged from 8.9% to 9.5% every year since 2004. That is a huge jump. Second, tax revenues are expected to rise 7.2% despite a 2.4% drop in nominal GDP. This tax buoyancy is twice as large as in 2010 when taxes rose sharply as a condition for the bailout. That too seems optimistic. All this to avoid cutting spending. The political problem is a halfhearted commitment to reform. For 18 months, the government pushed for reform just enough to alienate those who stand to lose from it but not enough to gain the favor of those who stand to benefit from it. Whether this changes in 2012 depends on whether politicians realized that there is an electoral future for reformers. A political coalition will pit two forces against each other. On one hand are those who benefited from the old system: public sector employees and private sector professionals who evaded taxes and who enjoy protections in their respective professions. On the other hand are private sector employees who subsidize either the state employees (through taxes) or the professionals (through higher prices for goods and services). But there is also a silent majority: poll data show that 30%-40% of the electorate would abstain if elections were held today. Disappointment is widespread and can be turned into a galvanizing political force for both good and bad. When Greece received its first bailout in mid 2010, our finance minister said something wise: the people will accept pain if it shared evenly; if we start making exceptions, they will not stand for it. No prediction has been truer. The government’s popularity held through 2010 when it refused to back down during confrontations. It was in 2011, when the first exemptions started to surface during the debate for liberalizing the private sector that polls registered mounting dissatisfaction. Then came little progress in fighting tax evasion, battling corruption or shrinking the state. The faith in equal pain collapsed. This is where economic policy meets politics. The halfhearted commitment to reform is bad politics and bad economics. A strong commitment to reform, coupled with a sense of fairness and even-handedness, can energize a sizable political consistency. It can also, by producing a spending-driven reduction in the deficit, allow the people to start spending again. 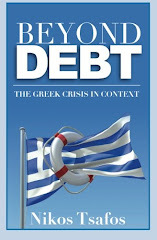 But patience is thin: 2012 is the make or break year for Greece. Short summary of your excellent analysis: Greece needs a wonder! Is Austerity All that Bad? Is the Euro Good for Europe?